TORONTO, ON--(Marketwired - September 27, 2016) - Marathon Gold Corporation ("Marathon" or the "Company") (TSX: MOZ) announced today continued success from the ongoing drilling campaign at the Marathon Deposit, Valentine Gold Camp. New drill holes MA-16-114, MA-16-116, MA-16-117, MA-16-118 and MA-16-119 intersected significant intervals of good-grade gold mineralization with MA-16-116 intercepting wide gold intervals up to 70 meters down-dip of previous drilling on the Marathon Deposit (Figure 1). Previously reported drill holes MA-16-113, MA-16-112, MA-16-111, MA-16-107, MA-16-101 and extended drill holes MA-15-032 and MA-15-047 all intersected similar wide intervals of higher grade gold at depth (Figure 1). The new drilling further confirms the continuity of the 50-100 meter wide (true thickness) sub-vertical mineralized corridor of the Marathon Deposit, which is currently open along strike and extends to depth in excess of 250 meters. Marathon's current drilling is now focused on expanding the Marathon Deposit towards the southwest along strike and to depth. In early October, Marathon will add a second drill at the Leprechaun Deposit in support of a revised resource estimate expected to be completed in the first quarter of 2017. Best intercepts in MA-16-116 included 2.16 g/t Au (cut) over 66.3 meters with 10.65 g/t over 3.3 meters, 10.24 g/t over 2.0 meters, 9.36 g/t Au over 0.7 meters, 8.05 g/t Au over 0.7 meters, 24.14 g/t Au (cut) over 1.3 meters and 6.00 g/t Au over 1.3 meters. These new intercepts are 70 meters down-dip from previously drilling and represent a 40 meter SW step-out of the deeper higher-grade mineralized zone intersected in previously released drill holes MA-16-101, 107, 111, 112, 113 and MA-15-047 and 032 (Figure 1). Step-out drill holes MA-16-117, MA-16-118 and MA-16-119 intersected significant gold mineralization within 90 meters of surface (Figure 1). Best intercepts included: MA-16-117 intersecting 6.90 g/t Au over 4.2 meters with 11.58 g/t over 0.6 meters and 17.56 g/t Au over 0.6 meters as well as 2.66 g/t Au over 4.2 meters with 14.22 g/t Au over 0.6 meters, MA-16-118 intersecting 4.92 g/t Au over 2.0 meters, and MA-16-119 intersecting 0.63 g/t Au over 13.8 meters and 4.39 g/t Au (cut) over 5.40 meters with 33.0 g/t Au (cut) over 0.6 meters. Hanging wall shallow drill hole MA-16-114 successfully intersected near surface mineralization with 2.55 g/t Au over 2.4 meters including 9.70 g/t Au over 0.6 meters. Near surface mineralization in the hanging wall of the Marathon deposit will contribute to lower strip ratios for the open pit. Deeper penetrating new drill hole MA-16-116, along with recently released deeper drill holes MA-16-112, MA-16-113, MA-16-111, MA-16-107, MA-16-101 and extended drill holes MA-15-032 and MA-16-04, define a more than 250 meters in strike length, sub- vertical mineralized corridor that ranges from 50 to 100 meters in width, and extends to depth beyond 250 meters. 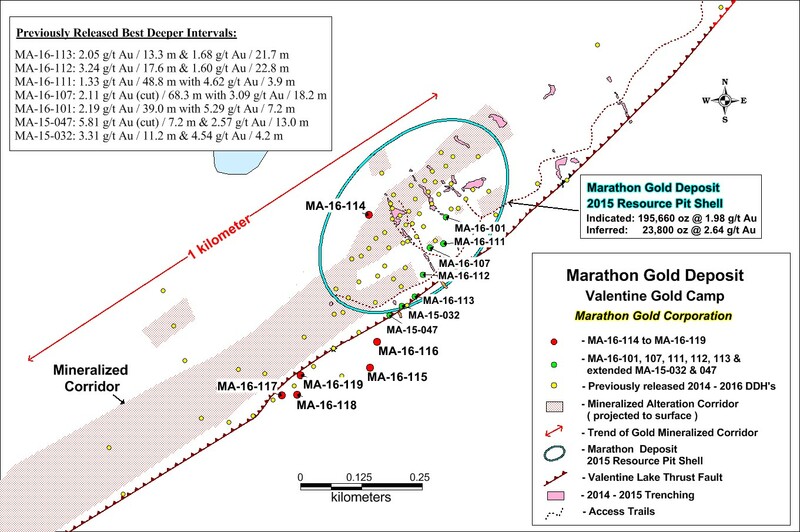 This mineralized corridor of the Marathon Deposit remains open both along strike and to depth with gold grades increasing at deeper levels within the corridor. The total strike length of the alteration and mineralized corridor, including the spring 2015 Marathon Deposit 450 meter in strike length open pit resource shell, now extends for at least 1.7 kilometers with priority drilling at the Marathon Deposit focused on expanding the open pit resource shell to the southwest along strike of the current Marathon Deposit resource pit shell as well as northwest into the hanging wall of the deposit. Trenching and channel sampling has commenced at the new gold showing located 1 kilometer northwest of the Valentine Lake Thrust Fault and 800 meters north of the Sprite Zone. The new showing contains an extensive array of extensional QTP veining with initial grab samples ranging up to 6.65 g/t Au, 5.36 g/t Au and 3.44 g/t Au. 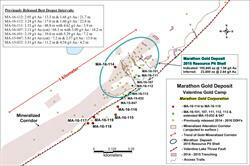 "Our continued success in intersecting wide intervals of good gold grades both at depth and along strike in the Marathon Deposit area is very exciting as we work towards significantly increasing the gold resources at the Valentine Gold Camp with a new resource expected in the first quarter of 2017," said Phillip Walford, President and CEO of Marathon. "Our current drilling on the Marathon Deposit is focused on developing potential open pit resources to the south west of the 2015 resource pit shell and a second drill will be in place by early October to commence drilling on deeper zones of the Leprechaun Deposit." TABLE 1: Significant fire assay intervals from drill holes MA-16-114, MA-16-116, MA-16-117, MA-16-118 and MA-16-119, Marathon Gold Deposit, Valentine Lake Gold Camp. Marathon acknowledges the financial support of the JEA Program, Department of Natural Resources, Government of Newfoundland and Labrador. The Research and Development Corporation of Newfoundland and Labrador has granted approximately 75% of the costs of the current metallurgical program to Marathon Gold, and we appreciate this support. Figure 1: Location map showing the new drill holes MA-16-114 to MA-16-119, previously released deep targeted drill holes MA-16-101, MA-16-107, MA-16-111, MA-16-112, MA-16-113 and extended drill holes MA-15-032 and MA-15-047. Figure 1 also shows the 450 meters strike length of the spring 2015 Marathon resource pit shell and more than 1 kilometer in strike length mineralized corridor.